This game was immediately brought to life in the 1st minute when BBC were awarded a penalty for a challenge just inside the box. The Penalty was dispatched well into Conor Sullivan's right corner with the goalkeeper given no chance. Prosperous slowly started to come into the game with great work from Tadhg Carney & James Ansell creating a few chances but the BBC goalkeeper was well positioned each time to make comfortable saves. BBC created little in attack in the remainder of the 1st half. BBC started the brightest in the 2nd half & almost caught Prosperous out with some clever balls over the top & but for swift work by George Colville & Hugh Scully they might have increased their lead. As the 2nd half wore on the good football that Prosperous normally play was reduced to hopeful balls into the BBC half which played into the BBC counter attacking style. As time started to run out, Prosperous had a couple of chances but brave defending by BBC meant it was not to be on this occasion. The last chance fell to Simon Ennis but his strike was into the ground & allowed the home keeper to save easily. Both Teams started off with great intensity with Prosperous having some early chances falling to Simon Ennis & Patrick Mitchell. Arlington took the lead after 20 mins when a ball over the top was chased & although Conor Sullivan made a great save the rebound fell to an Arlington striker 1st. Straight away Prosperous fought back with Patrick Mitchell scoring following a cut in from the left. A 2nd goal soon followed when a cross from Patrick Mitchell was knocked in by an Arlington defender. The teams went in all square following an Arlington freekick which Conor Sullivan saved but again an Arlington player was 1st to the ball. The 2nd half was a completely different game with Prosperous taking the lead when Simon Ennis scored followed by a superb goal from Tadhg Carney cutting in from the right wing & waltzing past several defenders. Conor Sullivan made 2 great saves to keep Arlington at bay & another strike from Simon Ennis had Prosperous cruising & they took there foot of the gas allowing Arlington to score a 3rd. Shane Condell came on for Prosperous & scored 2 excellent goals before Tadhg Carney completed the scoring for the home team. Arlington scored just before the end of the game following a long cross into the box & a neat flick from their striker. THis game started with great gusto & was initially a battle for midfield supremacy. Prosperous had a couple of early chances with efforts from Simon Ennis, Patrick Mitchell & James ansell failing to hit the Kilcullen goal. The lead came after 20 mins with Kilcullen midfielder driving towards the Prosperous area before unleashing a drive into the bottom corner. It got worse 5 minutes later when Prosperous failed to deal with a ball into the box & a flick floating over the stranded Conor Sullivan. Finally before half time a freekick was conceded & although not well struck it managed to find its way into the bottom corner. Half time team talk over & the Prosperous team started to make some headway only to go 4-0 down when a Kilcullen midfielder was unmarked in the box & easily headed in. Eventually the guys knuckled down & Simon Ennis scored with a well taken shot passed an impressive Kilcullen goalkeeper. It looked like we might be capable of getting something from the game when shortly afterwards Tadhg Carney scored a 2nd to reduce the deficit. Try as they might the lads just could not get another although we hit side netting & a great save from a James Ansell shot it was not to be our day. 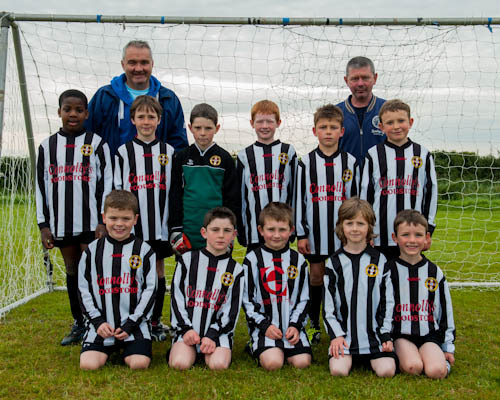 The Club would like to wish Club President Eamonn Darcy. A Very Happy Birthday today. Eamonn Celebrated his Birthday with his family. The Club made a presentation to Eamonn on reaching his 80th Birthday. 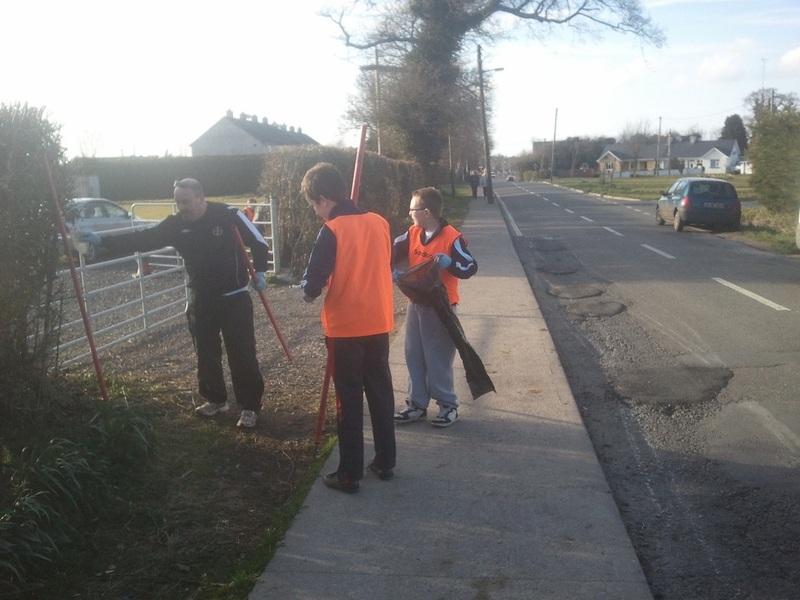 Prosperous United AFC Help the Tidy Towns with cleaning the village. 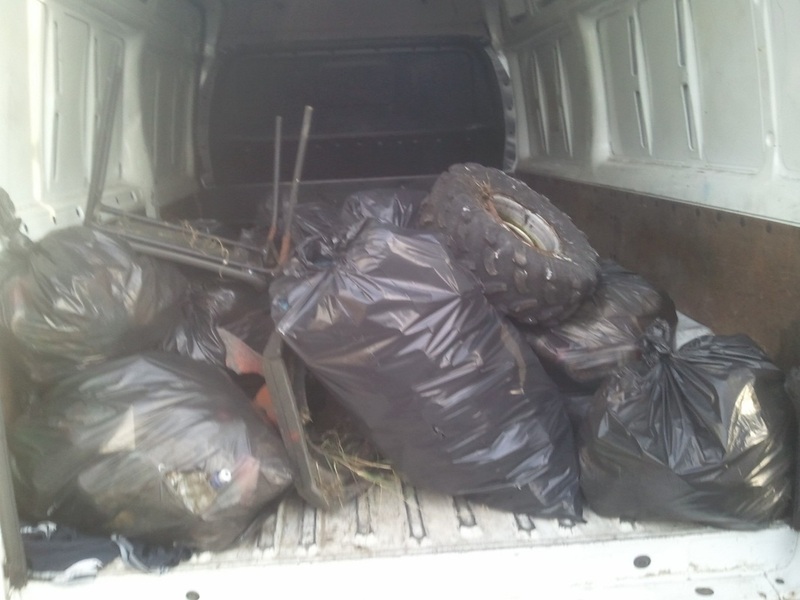 We cleaned out 18 bags of waste from the pitch & surrounding area.. The majority of the waste was plastic bottles. . 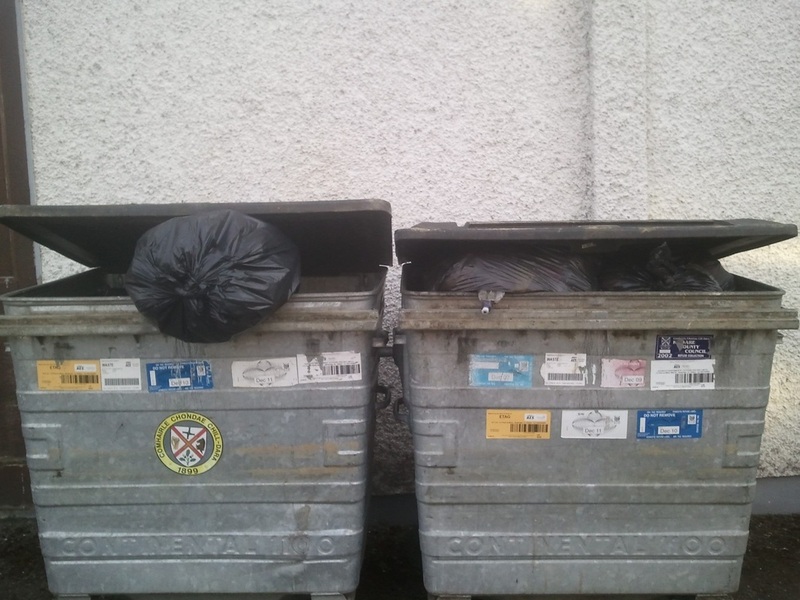 Please place your waste in the bin provided. Logo for rules & details on how it works. Prosperous United Girls Soccer Team ( Metropolitan Girls League ). This was Prosperous Utd first game since mid November & it showed with a sluggish start to the game. Takles were being mistimed & in general the standard of football was not what we have come to expect from this team. The 1st goal of the game came after 20mins when a corner for Kildare Town was not defended well & a free header at the back post gave the visitors the lead. Matters were not helped when a challenge by Tadhg Carney resulted in a tangle of legs & he needed to be substituted due to an ankle injury. This meant that the whole team was a little unbalanced butseemed to stir something in the Prosperous Team & the response was swift with 2 quick goals from James Ansell following good work by Shane Condell & Simon Ennis. Prosperous were in the accendancy but could not increase their lead as the half time whistle went. The 2nd half started with Kildare looking to get back on terms & after 10 mins a cross into the box resulted in the ball crossing the line courtesy of a deflection from a Prosperous player. With Kildare looking to push on they were caught by 2 well taken goals by Simon Ennis, the 1st was when he latched onto a ballinside the area & squeezed it under the Kildare keepers body, the 2nd was when he latched onto a long ball from the defense & cooly placed the ball into the far corner as the goal keeper advanced. This seemed to give the Prosperous team a huge boost & they took control of the game with the defence well on top of anything Kildare could muster. The goal of the game came with about 10mins left when Joey Balfe stayed in an advanced position was alloed to turn & rifle a bullet volley into the far corner of the net. A great result after a long time without football & a good all round team performance following some harsh words at halftime by the Prosperous Management Team. 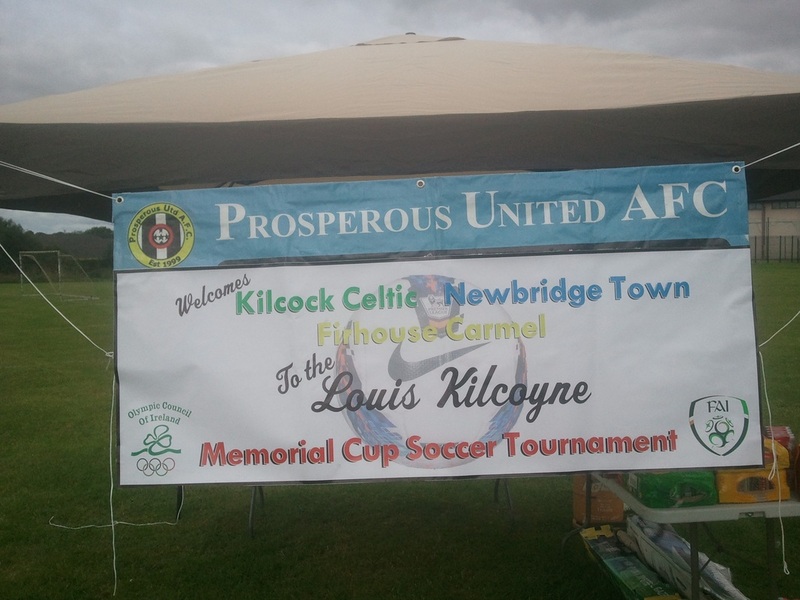 Some notable performances from Dean Kirwan, Sean Kehoe, Sean Durkin, Jamie Doyle & both double goalscorers Ennis & Ansell. This was a lively game well contested with both teams fighting hard for the spoils. In the 1st 15 minutes both teams battled for dominance with neither giving way & this resulted in a very entertaining game for the spectators. BBC had a few long range efforts which did not worry Prosperous Keeper Donal Molloy. Prosperous started to gain the upper hand towards the later part of the half & duly took the lead following some sleek interpassing between Tagdh Carney & Dean Kirwan with Kirwans defence splitting pass allowing James Ansell to cooly slot home for what was a well deserved lead. The 2nd half started with BBC in contorl in midfield & they started dictating the play & this resulted in Prosperous defending deeper into their own half. Eventually the visitors got their deserved equaliser when a clearance was not made & the block down resulted in BBC scoring. This gave the BBC team great heart & they tried to push home their advantage with several efforts that did not duly worry the home keeper. A great challenge from Hugh Scully prevented a certain 2nd goal for BBC & good work from Joey Balfe , Stephen Ryan & Sean Kehoe kept them at bay until 15 minutes to play when a penalty was awarded & dispatched by BBC. Prosperous tried in vain to respond & a last minute effort from James Ansell which just cleared the cross bar after good battling in the BBC box brought an end to a very good game. 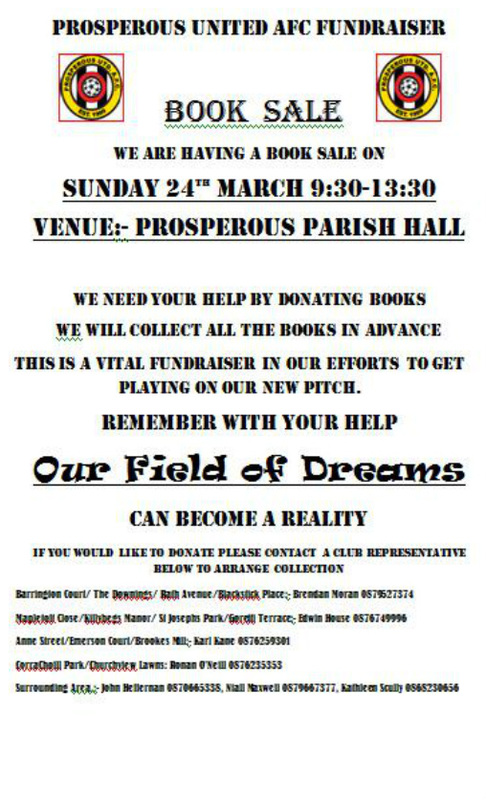 A FIELD OF DREAMS THE NEW HOME OF PROSPEROUS UTD AFC. READY FOR 2014 WITH A LITTLE HELP. CHECK OUT THE GALLERY PAGE FOR LATEST PICTURES.. 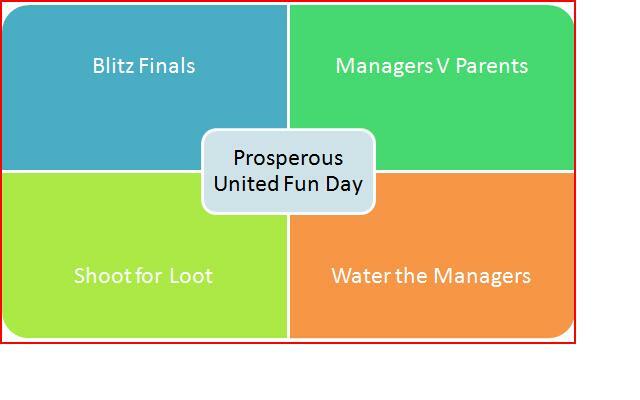 The Committee of Prosperous United AFC would like to thank everyone who helped make the end of Season Finale Blitz & Funday an overwhelming success. 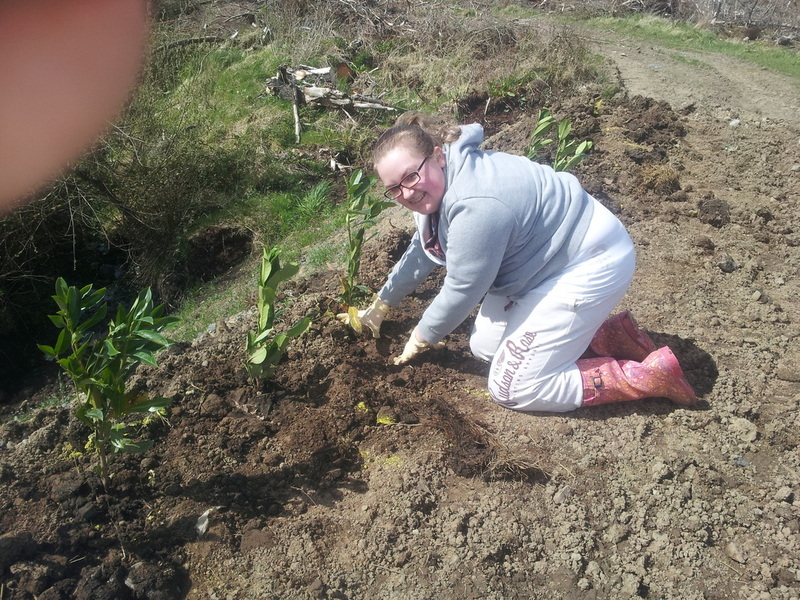 Helped in no small terms by the wonderful weather on Saturday. For all who donated Items Thank You so much. We will look forward to seeing you all again next Season. 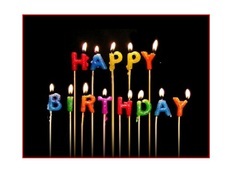 Thanks to Bounce for Fun Party Hire & CPH Hire for your contributions to make the day great & memorable.